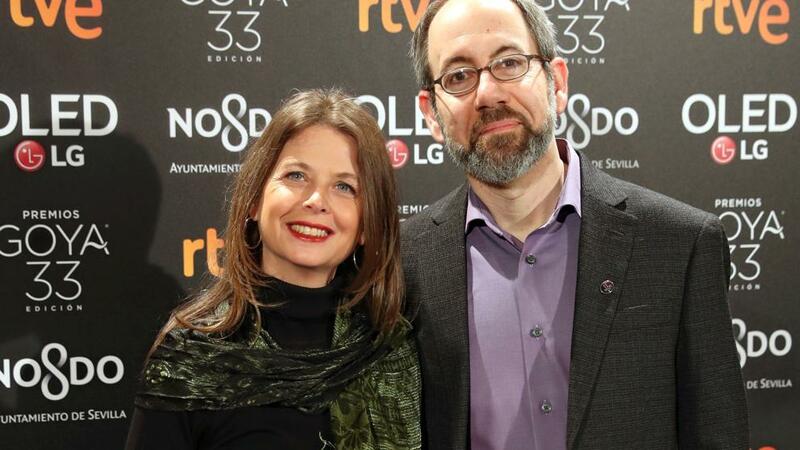 NYU Madrid Professors and Emmy-winning filmmakers Robert Bahar and Almudena Carracedo have just premiered their new documentary film, The Silence of Others at the 68th edition of the Berlinale. The film has won two prestigious awards: the Berlinale Panorama Documentary Audience Award and the Berlinale Peace Film Prize. The film, The Silence of Others, reveals the epic struggle of victims of Spain’s 40-year dictatorship under General Franco, who continue to seek justice to this day. Filmed over six years, the film follows victims and survivors as they organize the groundbreaking “Argentine Lawsuit” and fight a state-imposed amnesia of crimes against humanity, in a country still divided four decades into democracy. Around the table, from bottom left going clockwise, are: Professor Justin Sterns, NYU AD, Professor Sarah Pearce, NYU NY, Professor Ross Brann, Cornell University, Professor María López, NYU Madrid, Professor Almudena Ariza, NYU Madrid, Professor Mariano Gómez, NYU Madrid and the Consejo Superior de Investigaciones Científicas, Professor Ana Echevarría, Universidad Nacional de Educacción a Distancia, Professor Marianeles Gallego, Consejo Superior de Investigaciones Científicas, and Professor Robert Lubar, Institute of Fine Arts, NYU and Director, NYU Madrid. On February 20-21, 2017, NYU Madrid convened a symposium in Abu Dhabi hosted by the NYU Abu Dhabi Institute. The symposium, Islam and Spain, featured talks and panels with four scholars from NYU Madrid as well as scholars from NYU, NYU Abu Dhabi, Cornell, and other institutions. Islamic Spain is characterized as a uniquely productive cultural cooperation between the three Abrahamic faiths — Judaism, Christianity, and Islam. Marking the 70th anniversary of the publication of Americo Castro’s España en su historia, the historiography that laid the groundwork for the understanding of medieval Islamic Spain, the symposium revisited key thematic issues from Castro’s work and reassessed them in light of the decades of scholarship that has evolved since. The goal was to explore the culture of Islamic Spain by focusing on specific intellectual, cultural, literary, and artistic developments, and moving away from the arguments surrounding the nature of medieval Spanish convivencia — the “living-togetherness” that Castro brought to light. 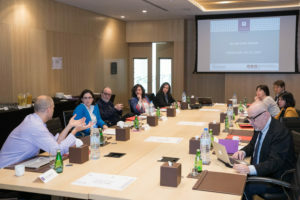 NYU Madrid Site Director Robert Lubar organized the symposium, working closely with his faculty and the NYU Abu Dhabi Institute to hold the event. 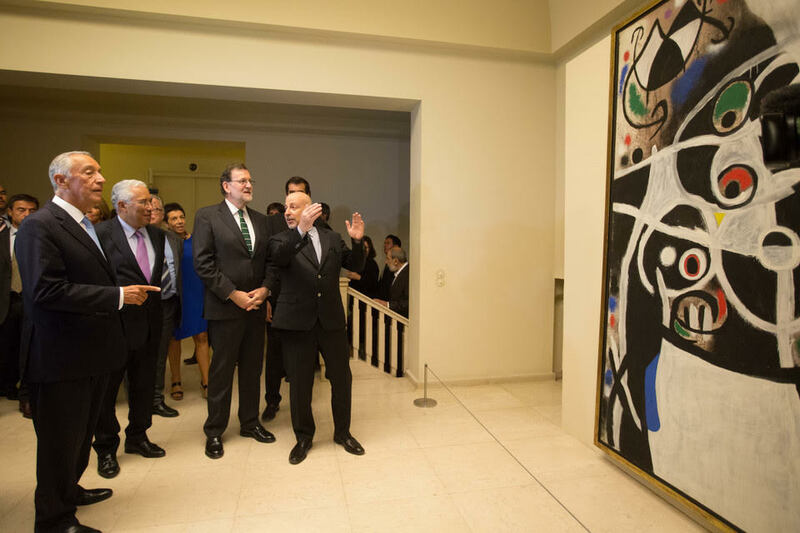 NYU Madrid Director Robert Lubar’s exhibition “Joan Miró: Materiality and Metamorphosis” at the Museu Serralves in Oporto has been visited by high level dignitaries, heads of state, and royalty. The exhibition opened on September 30th and closes on January 28th. 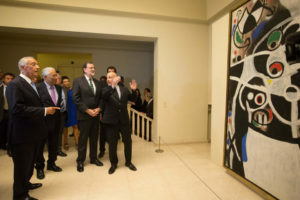 It is a show of the Portuguese State’s collection of 85 works by Joan Miró, and inaugurates what will now be a permanent installation of Miró’s works at the Serralves. This photograph includes, from left to right, the President of Portugal,Marcelo Rebelo de Sousa, me, the President of Spain, Mariano Rahoy, the Prime Minister of Portugal, António Costa, the President of the Fundacao Serralves, Ana Pinho, the Mayor of Oporto, Rui de Carvalho de Araújo Moreira, the Minister of Culture of Portugal, Luís Felipe Castro Mendes, and, Professor Lubar’s partner Graeme Williams. Professor Lubar is explaining the significance of Miró’s work to the guests. This photography features Professor Lubar with the King Felipe VI and Queen Leticia of Spain, who came to the exhibition for a private viewing in December. The royals are clearly impressed. NYU Madrid Site Director, Rob Lubar, associate professor of fine arts at the Institute for Fine Arts and Director of the Joan Miró Chair at the Universitat Oberta de Catalunya, has curated an exhibit on Miró in Oporto, Portugal. The exhibit, Joan Miró: Materiality and Metamorphosis, is on display at the Serralves Museum of Contemporary Art. We asked Professor Lubar for his thoughts on mounting the exhibition, and more broadly on Miró’s work. When I was asked to curate the Portuguese State’s collection of 85 splendid works by the Catalan artist Joan Miró, I was delighted. I’ve dedicated a good part of my professional career to studying the art of Joan Miró. In 1988 I delivered my doctoral thesis at NYU’s Institute of Fine Arts on Miró’s early work. Since then, I’ve written extensively about Miró and am currently serving on the Board of Directors of the Fundació Joan Miró in Barcelona. I am also the Director of the Càtedra Miró at the Open University of Catalonia and the Research Director of the International Miró Research Group. The opportunity to curate the Oporto exhibition at the Serralves Museum, and to write a catalogue, has been one of the great pleasures of my academic career. The collection, which contains a number of major works of historical importance and is uniformly of high quality, was acquired by the Portuguese State in an unusual way. The 85 works were purchased by a Portuguese bank as an investment opportunity. When the bank failed, it was rescued by the Portuguese State, to which the collection passed. Two and a half years ago, under a different government, the Portuguese State attempted to auction the collection at Christie’s London. There was a huge public outcry in Portugal and the collection was withdrawn from sale. At that time, I had been invited to deliver a plenary lecture before the sale. I was deeply disturbed that a collection of such great cultural value was being sold, as the decision struck me as politically driven. Fortunately, with the controversy that followed, the collection remained in Portugal but a final disposition for it was not made until recently. The current government decided to show the collection publicly in Portugal for the first time, and I was brought on board as curator. Not only is the exhibition at the Serralves Museum a huge success, but it was announced at the inauguration, in the presence of the Prime Minister of Portugal, the President of Portugal, the President of Spain, the President of Catalonia, the Mayor of Oporto and various Ministers of Culture that the collection would remain in Portugal and would find a permanent home in the Serralves Museum. To have had the privilege to work with this great collection and to have had a hand in establishing a new museum in the magnificent city of Oporto has been enormously satisfying. With the Fundació Joan Miró in Barcelona and the Fundació Pilar i Joan Miró in Palma de Mallorca, the Serralves Miró collection forms a cultural triangle in the territories of the Iberian Peninsula. There will be numerous opportunities in the future for collaboration among these and other institutions, and I look forward to a close working relationship with the curators and administrators of the Serralves Museum. Joan Miró: Materiality and Metamorphosis, which is on display through January 28, 2017, is comprised of 85 works by Miró owned by the Portuguese state, many of which have never been seen before by the general public, including six of his paintings on masonite produced in 1936 and six “sobreteixims” (tapestries) of 1973. 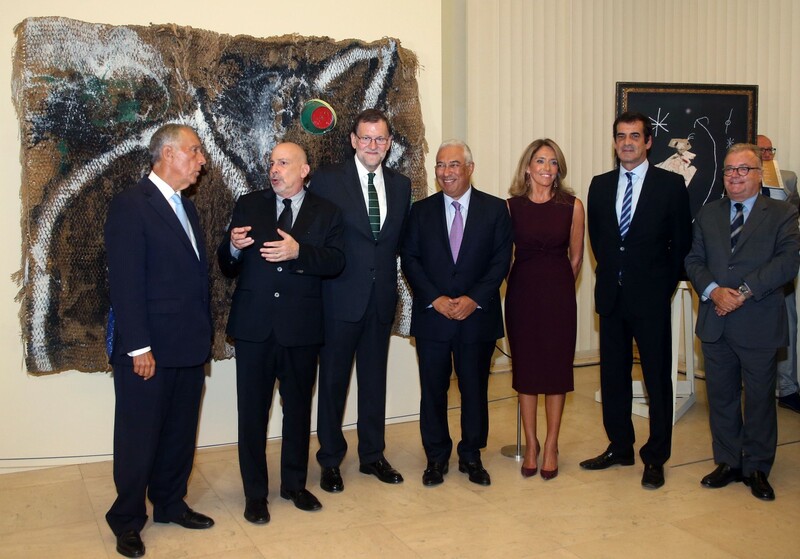 Robert Lubar discussing Miro with the President of Portugal, the Prime Minister of Portugal, and the Prime Minister of Spain at the exhibit opening in September. The exhibition covers six-decades period – from 1924 to 1981, though it focused on the transformation of pictorial languages that the Catalan artist first developed in the mid-1920s. The exhibition considers his artistic metamorphoses across the mediums of drawing, painting, collage and work in tapestry. Miró’s visual thinking and the ways in which he negotiates between optical and tactile modes of sensation is examined in detail, as are the artist’s working processes. 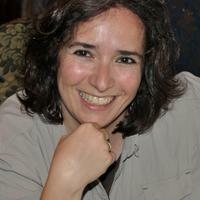 NYU Madrid Professor Almudena Ariza Armada was awarded the prestigious Javier Conde Garriga Jury Prize 2015 for her book on al-Andalús coins. The jury’s decision was unanimous and her work was described as “magnificent”. NYU Madrid Director Robert Lubar provides an update on the site and looks ahead to 2016. As Director of NYU Madrid it gives me great pleasure to share with you some of our exciting new initiatives for Spring 2016. With the guidance of our new Manager of Student Life and Housing, Rodrigo Urbina, we are establishing a Student Government Council at NYU Madrid in which our two NYU Ambassadors will work with other interested students to organise activities and town hall meetings on and off campus. We are also starting a soccer club and will arrange regular “partidos.” During Ally Week we will be organising a series of extra-curricular activities, including a screening of Vice Chancellor Linda Mills’s film “Of Many,” along with visits to Madrid’s Islamic Cultural Center and the Centro Sefarad. Rodrigo, in close collaboration with our Intern Sandra Fernández, has injected new life into our Intercambio Program (social exchanges between American and Spanish students), which has been enormously successful this year. Students, at their own expense, are also invited to participate in the Morocco Exchange Program, an educational, guided visit to Morocco from April 28 – May 2. Finally, beginning Fall 2016 students will also have the option to live in a new Residence Hall, in addition to participating in homestays. The MOOC is a collaboration between the Universitat Oberta de Catalunya (Open University of Catalonia) and the Fundació Joan Miró, Barcelona. Professor Lubar is the Director of the Cátedra Joan Miró at the Open University and is the Academic Director of the International Miró Research Group. Once you arrive at the sign-in page, go to “inscríbate”. That will take you to the matriculation page. Click on “Registro” and a prompt will ask for a username (your email). An email will be sent to you with your username and code (contraseña) at the bottom of the email. When you return to the main page https://www.miriadax.net/web/joan-miro you can then log in and at the bottom of the page you will see all the dates that the various modules will be available. Almudena Carracedo and Robert Bahar are the Emmy-award winning filmmakers of Made in L.A. (MadeinLA.com), a feature documentary that tells the story of three immigrant women’s transformation as they fight for their rights in Los Angeles garment factories. Praised by The New York Times as “an excellent documentary… about basic human dignity,” the film won numerous awards including an Emmy. Made in L.A. screened internationally at 100 film festivals and was the subject of an innovative community engagement campaign that led to more than 600 community and faith-based screenings that reached 30,000 people directly, in addition to the nearly two million people who viewed it on television. 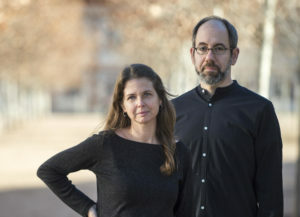 Both professors had prestigious careers prior to Made in L.A. and they are currently directing and producing The Silence of Others, a cinematic portrait of the first attempt in history to prosecute crimes of the Franco era in Spain, which has received support from the National Endowment for the Humanities, Sundance, ITVS and the Catapult Film Fund. They are also teaching a new course at NYU Madrid. Here they share their thoughts on teaching and filmmaking. I understand you are teaching a new course at NYU Madrid. Can you tell us a bit about the course and why it’s exciting? The course, which is called “Madrid Stories”, uses the process of making short documentary films to immerse students in researching, exploring and engaging with Madrid. We study Madrid as a city, we study documentary as a form, and we study documentary filmmaking skills. Students then apply what they are learning as they venture out into Madrid, in teams of two, to make their own short documentary films and, in the process, uncover new people, stories and places, and strive to represent Madrid in ways that may counterpose mainstream images. This semester we’re running a short version of the course as a pilot. Students are creating short “City Symphony” films, a filmic subgenre that originated in the early days of cinema and that aims to capture the rhythm, dynamism and texture of a city or a neighborhood. In the Spring, we will run the full course, “Madrid Stories,” and students will make longer films that explore the city through stories of unique people and places. It’s important to point out that this is not just a film production course. Students must investigate their subjects, write a well-researched proposal, and reflect upon and analyze their films and their experiences in a final paper. There are cultural readings about Madrid, as well as readings and discussions to help students develop their own creative voices and to explore issues of authorship, representation and construction in documentary film. It’s thus an opportunity to think critically about Madrid and about the creative process itself. Even in the early days of this pilot, it’s thrilling to see the students so passionate about their subjects, and so deeply engaged with them by way of the filmmaking process. The “workshop” environment in the classroom is electric, and it’s exciting to see students sharing ideas and footage with their peers, and providing really valuable feedback on each other’s work. In a month, this semester’s students will complete their films and we’ll have a festive screening where they will present their films to the NYU Madrid community and beyond, and each do a Q & A. Sharing your work with an audience for the first time can be nerve-wracking but also magical, and there’s already much excitement in the air! NYU Madrid students Elizabeth Cortez and Olivia Valdez filming a scene with Professor Almudena Carracedo. What are the academic backgrounds of your students? The course has no prerequisites, and thus we are able to welcome a diverse group of students, which this semester includes students from Business, Communications, Political Science, Film, Television, Theater and individualized majors. It’s easy to understand why Film, Television and Theater students would be attracted to the course. But the interest is so much wider, and, across disciplines, there seems to be a hunger for both practical and rhetorical multimedia storytelling skills. Business and marketing students, for example, increasingly need multimedia skills; communications are increasingly multiplatform. “Madrid Stories” offers an opportunity to develop these skills, and to nurture one’s artistic and creative voice in the process of doing research and fieldwork. Finally, of course all of the students in Madrid are studying Spanish. “Madrid Stories” provides a special opportunity to go out into the city and practice using the language, while also enabling students to team up to accommodate varying levels of language skills. As Emmy-award winning documentary filmmakers yourselves, what drew you to teaching and how does it inform your own work? Teaching and mentoring have always been part of our filmmaking practice. Teaching filmmaking is exciting because you can really see when students start to “get it” and begin to express their own creative ideas through the form. Of course mastering the technical aspects is important, but it’s seeing new voices and points of view come through in the work that really excites us. And there’s no question that teaching and mentoring helps us grow too. It forces us to distill, articulate and interrogate our own artistic process. And it forces us to consider and support diverse artistic voices, some of which may run counter to our own instincts. Finally, the “workshop” environment in the classroom every week is really immersive and dynamic, and it keeps us fresh, in a way that just going to our own studio every day couldn’t. How do you think participating in your course deepens or alters the students’ understanding of Madrid? When you move to a new place for a semester, it can be hard to go out and discover everything that that new place has to offer, especially the more subtle, interesting things that lie below the surface. “Madrid Stories” forces and empowers students to go out into the city to explore and to research, develop and produce their own documentary projects. It’s an active experience, and you can’t help but experience and engage with the city. By making their projects really specific – for example, portraying a day in the life of one extraordinary, alternative, community-built plaza – students come to know exceptional places, they meet new people, and they become experts on a particular part of Madrid. Through those experiences, they deepen their understanding of the entire city. Ideally, it’s a process of researching, exploring, looking, and listening very carefully. Beyond their subjects and the filmmaking, we hope that they learn about themselves too, because their own artistic voices are also inherently part of their works. In addition to the projects themselves, we also offer optional outings to documentary screenings in Madrid, and, in the Spring, we’re hoping to offer some exciting opportunities in partnership with other film-related cultural institutions in Madrid. Our hope is that the course will be a gateway to a very special experience in Madrid. NYU Madrid students Paulina Orozco and Paloma Rabinov filming a scene in front of the Palacio de Cristal in Madrid’s Retiro Park. I understand that you are in Spain working on a project that explores the first attempt to prosecute crimes of the Franco era in Spain. Can you tell us about that work? 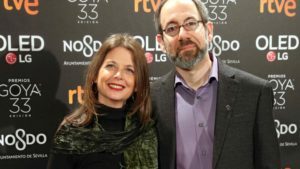 Our film is called “The Silence of Others” and, for two and half years, we have been following a team of human rights lawyers and former victims – now plaintiffs – who have filed the first lawsuit in history to prosecute crimes of Spain’s Franco dictatorship. The case brings together victims of cases of stolen children, re-education camps, torture and extrajudicial killings from throughout Franco’s 40-year dictatorship. The case is known as the “Argentine Lawsuit” because it has been filed in Argentina where a Judge has taken it on using the principle of universal jurisdiction, which allows courts to investigate crimes against humanity abroad if the country where they occurred refuses to do so. After years of preparation, what started as a small, potentially quixotic effort has now yielded the first-ever arrest warrants for Franco-era officials, including most recently, two cabinet ministers. The case has also brought this nearly forgotten struggle to the front page of The New York Times. But while the film is structured around the court case, our approach is deeply human and personal, and we are focusing on the stories of the plaintiffs, to understand what they experienced under the dictatorship, and to follow them on their journey in the lawsuit. Just like our previous film, “Made in L.A.” (www.MadeinLA.com), it is quite an intense, lengthy process. There are thematic parallels to our previous film too, as both deal with intense personal journeys of breaking silence and overcoming invisibility. What do you look for in developing projects and how do you convey what will make a film work to your students? We really want to see projects that work in two ways. First, the story, plot, characters and cinematic potential all have to be there. We want to be surprised, intrigued and awakened. But we also want to see films that have layers and subtext, and thus we are constantly asking what a film is trying to say, why a story is important, and how a very specific story, with all of its beautiful details, can convey something bigger or universal. Vision and passion are infectious, and we’re also always watching to see what each student will bring to their story that is special. In short, we ask: why are you the right person to tell this story? Beyond that, of course we want to be sure that each project is based on a solid foundation of research and that students have spent time developing and becoming passionate about their projects. What sorts of questions are you encouraging them to ask about Madrid? We really encourage students to look at Madrid, and to consider its history, its architecture, its people, its neighborhoods, and its place in the Spanish imaginary. We hope that they will come to see Madrid with a documentarian’s gaze and challenge assumptions embedded in mainstream representations of Madrid and Spain. How do certain neighborhoods or streets represent how Spain itself is changing? What demographic trends are taking place in Spain right now and how might one represent them? What little, off-the-beaten path stories might help unlock Madrid’s past? What stories point the way towards its future? What aspects of Madrid do even Madrileños overlook? And how does our position as outsiders impact our choices in representing Madrid? We just want to express our special thanks to NYU Madrid former Director, James Fernandez, who spearheaded the development of this course, to current NYU Director Robert Lubar, and to everyone at NYU Madrid, NYU’s Office of Global Programs, the Department of Journalism, the Department of Spanish and Portuguese, and the College of Arts and Science, all of which have supported the vision for this course and have invested in brand-new equipment and all of the resources needed to make this a reality. We join them in the excitement of seeing the films that our students will create each semester! Our classic course “Masterpieces of the Prado”, which meets weekly at one of the world’s greatest art museums (taught by Julia Domenech and Carmen Ana Sierra), is perhaps the best example of how our faculty and students take advantage of what Madrid has to offer. But virtually all of the courses in Madrid offer exciting co-curricular activities. Here are some recent highlights. The students in the class taught by Ana Dotras on García Lorca have been to the theater twice, most recently to see Lorca’s “The House of Bernarda Alba.” They also visited the Fundación García Lorca, within the Residencia de Estudiantes, where they were greeted by the poet’s niece, Laura [photo]. Jacqueline Cruz and the students in her “Cultural History of Spain” also visited the Residencia de Estudiantes, where Lorca, Buñuel and Dalí met, as did Carmen Bordón and her students.